Throughout the design of the Nautican Army it has become increasingly apparent that the main obstacle I am going to encounter is the availability of suitable miniatures. When one comes along, often from an email or forum message or my own "stumble surfing", then I stand up and take notice. This is exactly how I feel about the pictured miniature. Somehow I have to include this in the Nautican Army ! So, I'm thinking about a fast moving unit, which seems to befit the model and something with a lot of poisonous attacks but no protection and only average toughness. I would like to give the unit a unique feel and also would like it to be in keeping with the Nautican Army, which is designed to be a bit different with unusual attributes - difficult for "surface dwellers" to handle. The Octopus is a natually shy, reclusive creature that only emerges from rocky crevices to clasp and smother it's prey, infusing it with deadly toxins when necessary. Octobipods retain this predatory ability but... they are not shy ! Octobipods are difficult to fight and they use their tentacles to both attack, defend and smother their enemy. All shield bearing enemies in base contact suffer -1 to their armour save as the Octobipods attempt to prise the shields from their grasp. 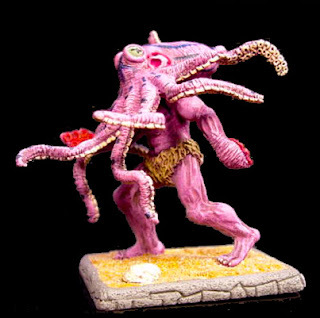 Additionally, all enemies attacking with basic hand weapons (not great weapons, halberds, spears, claws, hands etc) are encumbered by the Octobipods flailing tentacles and suffer -1 to hit. The number of attacking and defending tentacles on an Octobipod make it next to impossible to attack them from an undefended "quarter". Octobipods suffer no loss of rank bonus due to flank or rear attacks. Only 1 Octobipod unit can be included per Octopus Giganteus fielded in the same army. Note: I'm not sure how this will affect the rest of the army list right now. Although, I have to say that I'm not too averse to giving the player a wide choice of units providing there are some kind of limitations attached. I think it makes army selection and the tough choices to be made more fun. I'm very open to comments, suggestions and ideas, especially appropriate points costs or alternative profiles. Please leave them here or join the Battle Reporter forum and leave them in the Nautican Army project thread (Core Units). Image is © Armorcast.com All rights reserved. Used without permission.